News about ICBA UK’s activities. 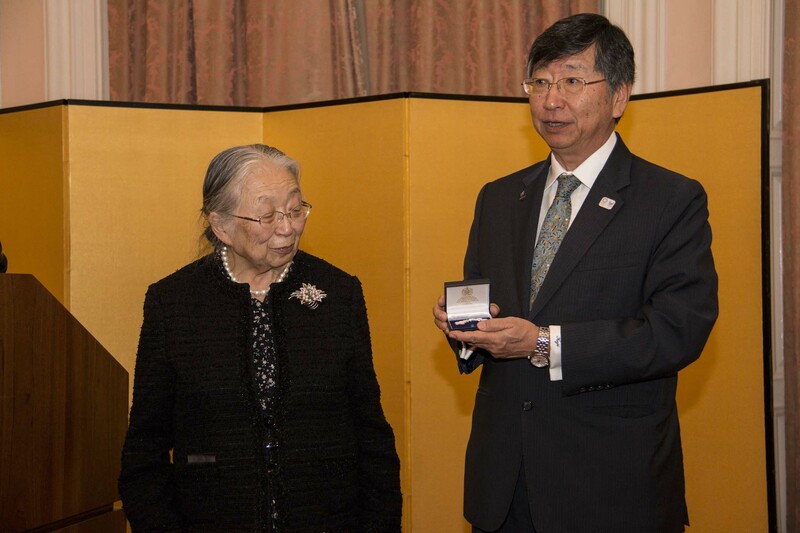 The Itochu Memorial Foundation Kodomo Bunko Promotion 2018 award ceremony was held on 1st March 2019. This year 78 bunko/organisations out of 138 applications were granted the awards. 12 overseas applications were made and 9 were granted the awards. From ICBA, two bunko from the UK made applications. 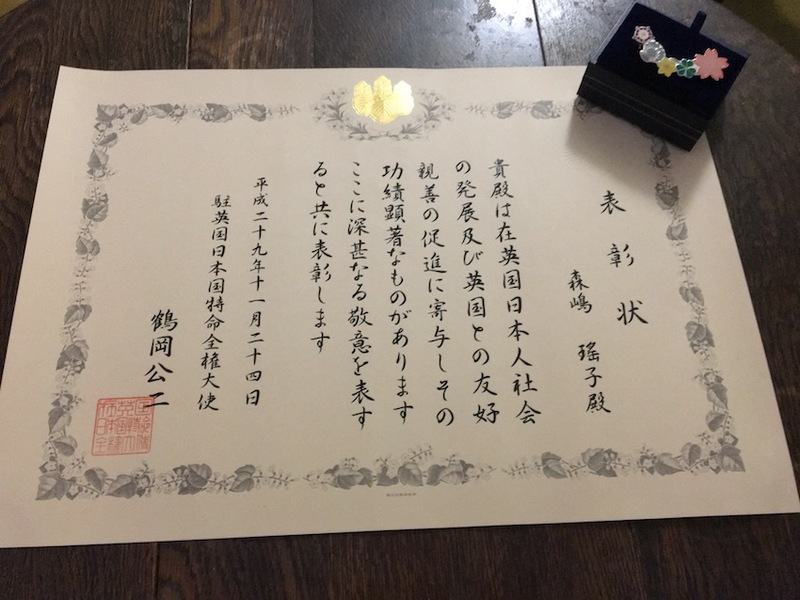 Nelson Bunko was awarded Y300,000 for the category “promoting/assisting the purchase of books for children” and Kabutomushi Bunko was awarded for the category “one hundred children’s books”. Three individuals were given an award for distinguished service, specifically running and promoting children’s bunko activities over a long time (over 20 years). 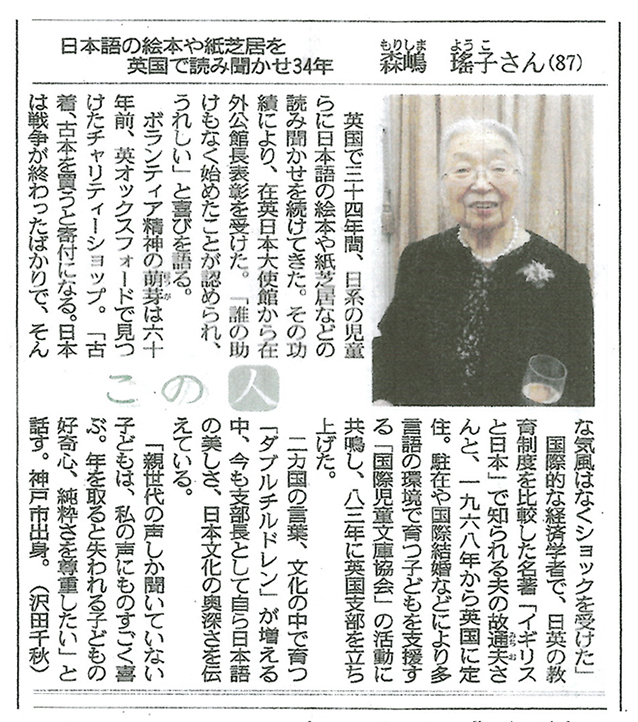 Ms Akie Maruyama of ICBA Tokyo Head Office was given an award for promoting International Bunko. On 24 November 2017, the ceremony for the bestowal of the Ambassador’s Commendation to Ms. Yoko Morishima, ICBA UK Branch Manager, was held at The Embassy of Japan. 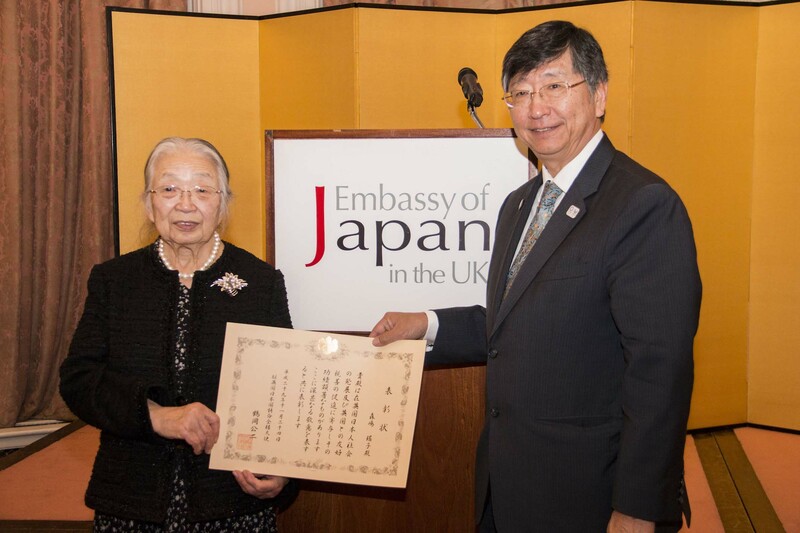 Her long term contribution to the Japanese community in London was highly appraised. We are so delighted and proud that her 40 year volunteer work, devoted to Double Children was appreciated. The award and brooch: the brooch was designed with 5 flower symbols representing, Cherry (Japan), Rose (England), Thistle (Scotland), Daffodil (Wales) and Shamrock (Northen Ireland). After the Great East Japan Earthquake and Tsunami hit Tohoku area in 2011, people around the world felt that they wanted to do something to help people who were suffering from the incident. We, at ICBA shared the same thought; what could we do to help them stand on their feet? What would be the things they wanted to receive? How could we send them in person? We were lucky to have got to know a priest at Rhyushoji Temple, Yamadacho in Iwate Prefecture. There were three nursery classes at Rhyoshoji Temple, where children were taught conversational English. The priest asked us if we could send them some English illustrated books for the children. We were happy to receive his request. All the IC Bunko in the UK came together and we sent books together with the cards that were created by all the children from each Bunko. We received a lot of thank-you cards in return from the children in Yamadacho. We, at ICBA sent them Christmas cards. We then received news such as New Year and graduation ceremonies. This is how our Friendship Card Exchange began. In 2016, on the 5th anniversary of the incident, we once again sent some illustrated books together with Friendship cards. It will be a long and difficult process until the areas will be the same as before the incident, but it was great to hear that people’s lives in Yamadacho are slowly returning back to normal. We had a pleasant surprise one day receiving lots of Kamishibai (paper theatre) from the priest. These were presents from Rhyoshoji Temple as the priest found that ICBA were getting short of Kamishibai. Kamishibai can be purchased in Japan but for children outside of Japan they are treasures. We would like to express our thanks to the priest and people at the nurseries for their kind thoughts and we wish that they continue to recover. We also wish for this friendship to flourish and continue in the future. We have a brand new website. We hope you enjoy it!